I’m not great at goals and resolutions. I’m an all-or-nothing girl who does really well with immediate efficiency but stumbles around long-term goals. Maybe it’s a little bit of fear of failure and a little bit I don’t want to put myself in a box. This year as I focus on being faithful, I want to establish new habits. I’ve been making my bed, trying to drink more water, walking on the treadmill or outside on the random warm days, and reading books instead of mindlessly scrolling. “So many” is relative because I know some people read more books than me. But, hey, I like to watch TV too. Anyway, I thought I’d share some ways I manage to read books while also mothering my children, who are currently 11, 9, and 3. I get quite a few free books through launch teams and blogger review programs. The deadlines that come with the review process keep me reading too. Plus reviewing books helps me process them and connect with other readers. 3. We spend a lot of time poolside. I devour some fiction books at the pool. In the summer, I’m easier going when it comes to chores and household tasks. (I’m trying to adopt that mentality year around, though!) Just one more chapter and then I’ll move the laundry to the dryer and start a new load in the washer! … at the doctor’s office, at the school pickup line, and when I eat breakfast. I’ve been known to buckle in my youngest and show up at the big kids’ school early just so I can read. Plus I’ve been consistent on the treadmill, so that gives me another window of reading time. 5. I stop reading books I don’t like. 6. I read what I’m in the mood to read. Typically, I read one book at a time, but I started the year with about three books going because they were different. One I needed to read slowly to digest, another was also non-fiction but easier to read quickly, and another was a memoir that I read in two sittings. I tend to go through fiction binges. I don’t pressure myself to read through a list. I choose my next book when I’m done with this one. 7. I keep a wish list of books. I love book recommendations, so I have an easy-accessible list on Amazon. I add to it often, order from it sometimes when prices drop, and consult it in the library, especially in the summer when I check out a few fiction titles at once. I also keep an Amazon list of good reads to share with others. As much as I like reading, I certainly also like talking about books. This is an edited and updated version of a post from a few years ago. I’m always impressed by your reading – 52 a year. One a week. I must do better. Is there a linkup? These are great tips. I love my Kindle for carrying lots of books with me and I usually have a few on the go at the same time as well! Thanks, Lesley! I’d love to hear what good books you’ve read lately. Thanks for the tips, Kristen. Blessings to you! My goal is also 52 books. Like you, I read a lot for my blog, but I’m also making time to read just for the love of it. Yes, I read far less non-fiction last year because I needed to enjoy stories more and not think as much about how I could be better. So there certainly are seasons for book genres for me. I always love seeing what you’re reading, Michele! I almost always have a book with me – in my car or in my purse. Makes waiting times so much more productive and bearable 🙂 These are great suggestions. Yes, me too! 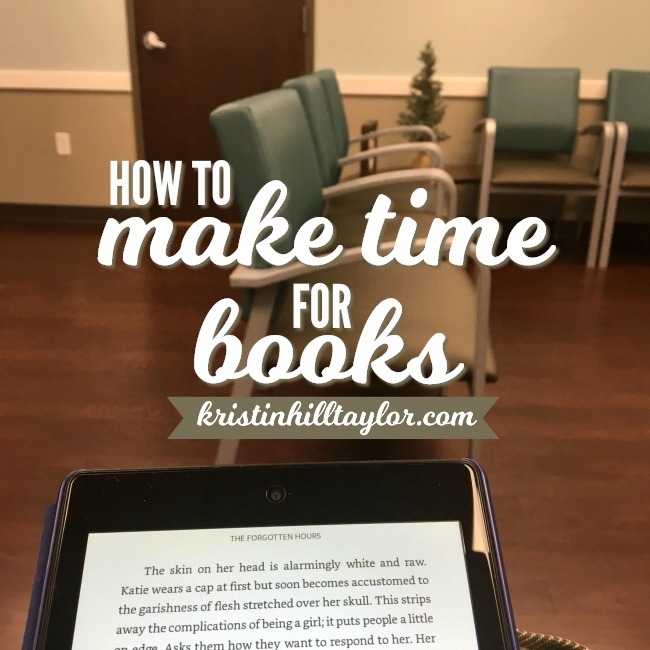 I had to wait 40 minutes yesterday for what ended up being a five-minute appointment, but I had time to finish the book I was reading! 🙂 Thanks for being here, Joanne! I agree about the Kindle app. It’s portability and ability to store multiple volumes and give me a list of my highlighted quotes are all big pluses. Plus most of my Kindle books have been free or 99 cents to $2.99. I like joining a couple of reading challenges – they expand my reading horizons, and just having the list and goal motivate me to get reading. But I don’t like to be so bound by reading commitments that I don’t have the freedom to pick up something interesting I find during the year, so I also need some flexibility. Audiobooks have been a great help to me as well. I started reading them when I had a longer commute to my m-i-l’s place when we moved here. I chafed at the “unproductive” time in the car. Audiobooks helped that driving time go by much faster. Now I also listen to audiobooks while getting dressed and fixing my hair and exercising – sometimes even while cleaning and cooking. That might not work so well with young children at home who need your attention and make their own noise. 🙂 I tend to listen to longer classics via audio – it helps because then they’re not taking up so much of the time for reading physical books. Yes, listening to audiobooks is a good suggestion too! I’ve only listened to a couple. I’m such a visual person and like seeing the words. My mind tends to wander when I’m listening to a whole book, but I have enjoyed podcasts when I’m in the car. Thanks for sharing your experiences here, Barbara! Great tips! #5 was a game-changer for me. When I finally convinced myself that I was not a failure if I didn’t finish a book I didn’t enjoy, I ended up reading so many more books I DID enjoy! It’s a very freeing thing. Yes, me too! It took me a while to embrace that freedom, but I’m so much better for it! I’m glad you’re here, Jana! I am a reader; an avid one. Always have been and always will be. It’s one of the things that brings me joy and forces me to expand my horizons while recognizing the vastness of human nature. I must say reading has made me more compassionate. I hate not completing a book I’ve started – it has to be really unappealing to me for that to happen. I love the goodreads app for reviewing books. And I don’t mind if a book is on a kindle or not – as long as I can read it. To answer your question – I read in the bathroom while I’m on the throne! Other than that I keep a book in the car and read while I’m on the elliptical. I’ve been known to read in the bathroom or while drying my hair! I love hearing from other readers. You’re right that reading makes our worlds bigger. Thanks for being here! Yes, yes, and yes! I love all your tips, Kristin. They hold true for me too (well, except I’m not at poolside very often, ha). Thanks, Lisa! Hope you’re reading something good right now! I just figured out how to copy my notes from a kindle book to Evernote where I keep all my book notes. So, simple. IF you don’t use Evernote you can cut and paste in your Word file. Oh that’s great! I don’t use Evernote … but maybe I should! 🙂 Thanks for being here, Mandy!